Marita has moved to Bergen together with her mother, who asked Marita to call her Kari now, and not mother anymore. Johannes is the son in a highly educated family, who starts a theatre group at school. He draws words out of his mouth, like baby birds. He says: skinning. Explosion. Marita, look at us. Remember this moment, for good. Be wanton. Like Icarus. Like me, is what he means. Andreas should have a twin brother, but he hasn’t. A house made of glass; he says when Marita asks about his childhood in the Ibsenstreet. All three are searching for their future. All three have to find their own way, and the chance to fail is high. Bergen Youth Theatre is a freestanding sequel to And the weather changed summer came and so on. 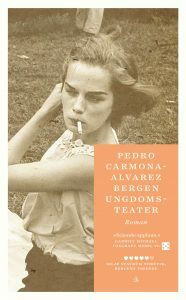 Carmona-Alvarez can give a sense of the passing of time and several years of growing pains in a single passage. He can capture theater, film, pop music or simply the experience of young people in one bright scene. The sequel to the book that received the P2-listeners literature award is the most beautiful depiction of youth this year. Poetic and wise, about the fragile and insecure phase where everything is open and at stake and stands and falls with friendships; added Bergen in the 1980s and 1990s.